This fun nautical design features a versatile light blue background with a lighthouse pattern on the top with coordinating light blue ocean waves on the bottom. A red stripe with a nautical darker blue rope through the middle brings both patterns together to create a beautiful nautical seascape design. 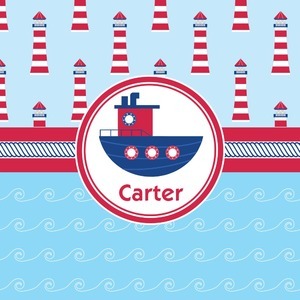 The center focal point of the design is a whimsical coordinating colored tugboat showcased in what looks like a ship's porthole with your personalized name under the tugboat.